In the Atlantic Ocean, a giant ‘conveyor belt’ carries warm waters from the tropics into the North Atlantic, where they cool and sink and then return southwards in the deep ocean. This circulation pattern is an important player in the global climate, regulating weather patterns in the Arctic, Europe, and around the world. Evidence increasingly suggests that this system is slowing down, and some scientists fear it could have major effects, such as causing temperatures to dive in Europe and warming the waters off the East coast of the United States, potentially harming fisheries and exacerbating hurricanes. A simplified diagram of the Atlantic Meridional Overturning Circulation. This ‘conveyor belt’ carries warm water from the tropics (represented by red arrows) into the North Atlantic. There, the water cools and sinks before flowing back toward the south (yellow arrows). This pattern of circulation plays an important role in regulating climate in the North Atlantic as well as the rest of the world. 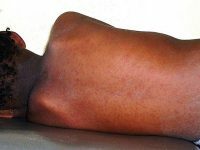 Image: Muschitiello et al. A new study published in Nature Communications provides insight into how quickly these changes could take effect if the system continues weakening. Led by scientists at Columbia’s Lamont-Doherty Earth Observatory in collaboration with the Norwegian Research Centre, the study is the first to precisely determine the time lags between past changes to the ocean conveyor belt and major climate changes. 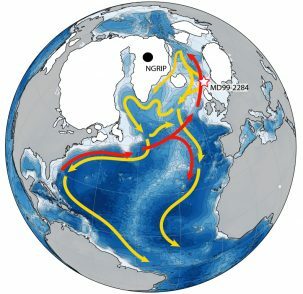 The team studied a key section of the ocean current pattern, known as the Atlantic Meridional Overturning Circulation (AMOC). They zeroed in on a section where water sinks from the surface to the bottom of the North Atlantic. They confirmed that the AMOC started weakening about 400 years before a major cold snap 13,000 years ago, and began strengthening again about 400 years before an abrupt warming 11,000 years ago. “Our reconstructions indicate that there are clear climate precursors provided by the ocean state — like warning signs, so to speak,” says lead author Francesco Muschitiello, who completed the work as a postdoc at Lamont-Doherty and now works at the University of Cambridge. 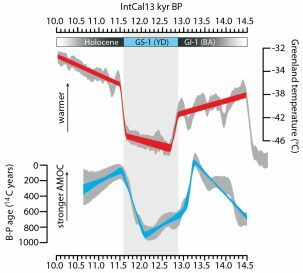 Until now, it has been difficult to resolve whether past changes in the ocean conveyor belt occurred before or after the abrupt climate shifts that punctuated the last deglaciation in the Northern Hemisphere. 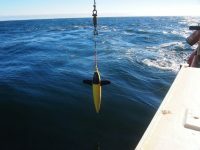 To overcome the usual challenges, the team pieced together data from a sediment core drilled from the bottom of the Norwegian Sea, a lake sediment core from southern Scandinavia, and ice cores from Greenland. Scientists typically rely on radioactive carbon (carbon 14) dating to determine the ages of sediments; measuring how much carbon 14 remains in a fossil reveals how long ago the organism died, and thus how old the surrounding sediment is. This relationship is tricky in ocean sediments, though, because carbon 14 is created in the atmosphere, and it takes time for the carbon to make its way through the ocean. By the time it reaches the organisms at the bottom of the water column, the carbon 14 could already be hundreds or thousands of years old. So the team needed a different way to date the sediment layers in the marine core. That’s why they measured carbon 14 content in a nearby lake sediment core. The ancient layers of the lake contain decaying plants that pulled carbon 14 directly out of the atmosphere, so the scientists could find out the age of each lake sediment layer. Then they used a few techniques to match the lake sediment core layers to the marine core layers. Ash layers from two long-ago volcanic eruptions in Iceland helped to line things up. This process gave the team the precise age of each layer in the marine core. Next, they compared the real age of the marine sediments to the age they were reading from the deep ocean carbon 14 measurements; the differences between these two gave them an estimate of how long it took for the atmospheric carbon 14 to reach the seafloor. In other words, it revealed how quickly water was sinking in this area, in a process called deep water formation that’s essential to keeping the AMOC circulating. Now they had a record of ocean circulation patterns in this region over time. The final piece of the puzzle was to analyze ice cores from Greenland, to study changes in temperature and climate over the same time period. Measurements of beryllium-10 in the ice cores helped the authors precisely link the ice cores to the carbon 14 records, putting both sets of data on the same timeline. Now they could finally compare the order of events between ocean circulation changes and climatic shifts. 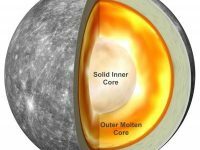 Comparing the data from the three cores revealed that the AMOC weakened in the time leading up to the planet’s last major cold snap, called the Younger Dryas, around 13,000 years ago. The ocean circulation began slowing down about 400 years before the cold snap, but once the climate started changing, temperatures over Greenland plunged quickly by about 6 degrees. The study finds that changes in AMOC strength (blue line) began hundreds of years before the sharp and abrupt temperature changes over Greenland (red line) that mark the beginning and end of the hemispheric cold snap known as the Younger Dryas period (shown here as a gray column). Image: Muschitiello et al. A similar pattern emerged near the end of that cold snap; the current started strengthening roughly 400 years before the atmosphere began to heat up dramatically, transitioning out of the ice age. Once the deglaciation started, Greenland warmed up rapidly — its average temperature climbed by about 8 degrees over just a few decades, causing glaciers to melt and sea ice to drop off considerably in the North Atlantic. Co-author William D’Andrea, a paleoclimatologist at Lamont-Doherty was surprised by what they found — he says the lag times are two or three times greater than he would have expected. For now it’s not fully clear why there was such a long delay between the AMOC changes and climatic changes over the North Atlantic. It’s also difficult to pinpoint what these patterns from the past could signify for Earth’s future. Recent evidence suggests that the AMOC began weakening again 150 years ago. However, current conditions are quite different from the last time around, says Muschitiello; the global thermostat was much lower back then, winter sea ice stretched farther south than New York Harbor, and the ocean structure would have been much different. In addition, the past weakening of the AMOC was much more dramatic than today’s trend so far. Thanks for confirming his knowledge. Hi Sarah, this is one of the better science articles I’ve read. It maintains a good balance between scientific depth for people interested in the details of the study and readability for people with a casual interest in the topic. It also doesn’t frame the study to fit a narrative (except for a few lines possibly), which I often see in science articles these days. I came away from reading this article with an understanding of what the study discovered and the implications for the modern world. Nicely done! Thank you, Jon! I’m glad you found it helpful. Temperature = Wind / Water + Geography!